My old Buddy walked with me from 2008 through 2015. Here he is, Mar. 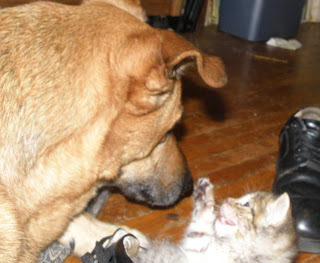 5, 2008, the day I brought him home from the Pasadena Humane Society Shelter. 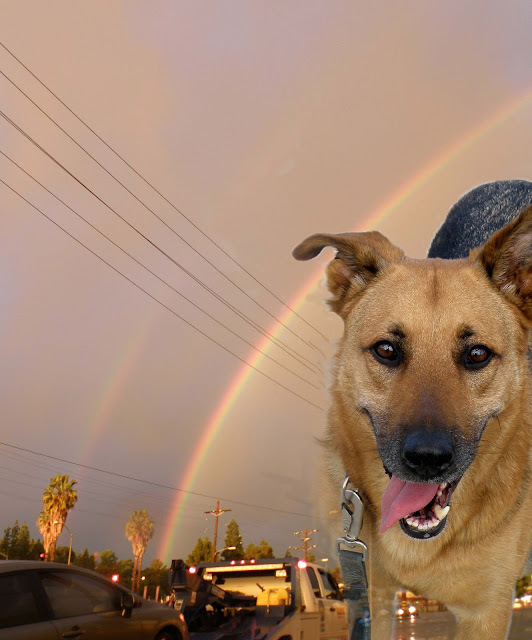 He was my travel companion and photographic assistant until his death Oct. 19, 2015. 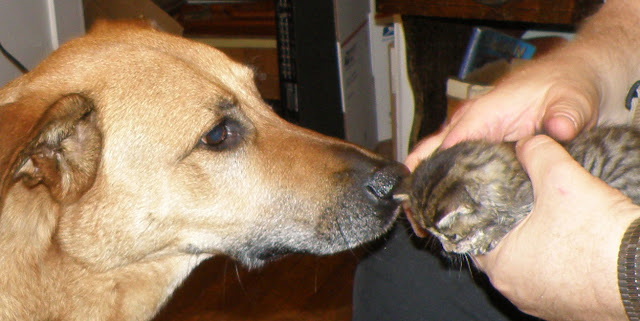 He looks young in this picture, but he was already about 5 years old, with a bit of grey on his chin. His first walk with me was at the Sepulveda Basin Recreation Area. He was a little thin then. He had been treated for worms at the shelter. The first thing I did was teach him not to chase bicycles. 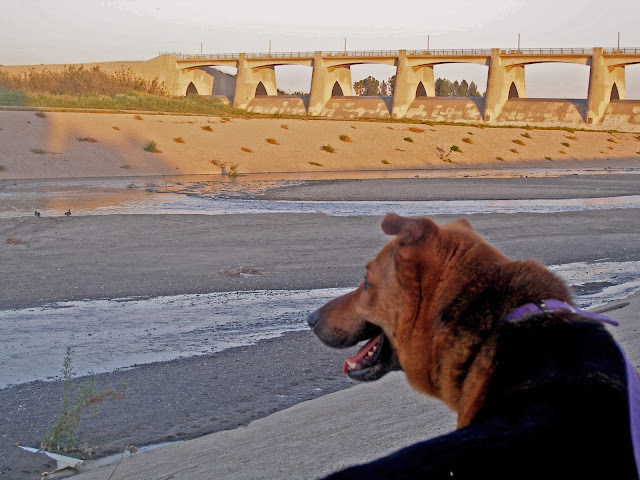 I probably adopted him too soon after my last dog died, but I was on an epic journey along the L.A. River, and I didn't think I could continue without a dog at my side. Here he is, watching the ducks at the dam. He practiced his sit-stay on the Wilbur Ave. Bridge. Cars whizzing over bridges made him a bit nervous, but it was a quiet afternoon. Crossing on the Corbin Ave. Bridge May 5, 2008. We reached the theoretical headwaters later that day. I felt rather lost after that, without a goal. For some reason, I decided to visit Bellflower. Painted utility boxes have reached my own neighborhood this year, but I saw them first in Paramount, Long Beach and Bellflower. I wanted to take him down the Ballona Creek Bike path too, but near the mouth, the access points were too far apart for me to walk. 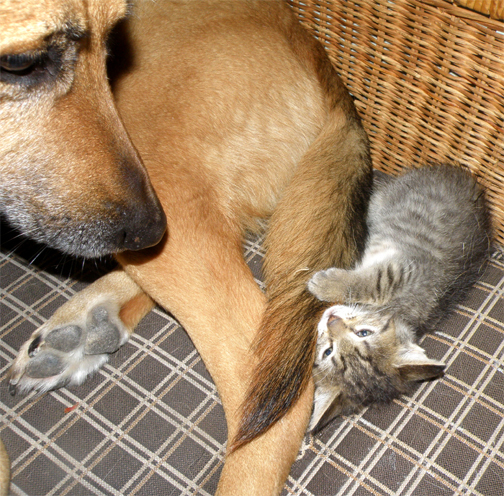 He could have done it, I'm sure, but he wasn't going anywhere without me. We did explore surrounding areas in Culver City, however. Los Angeles State Historic Park was a favorite place we visited many times. 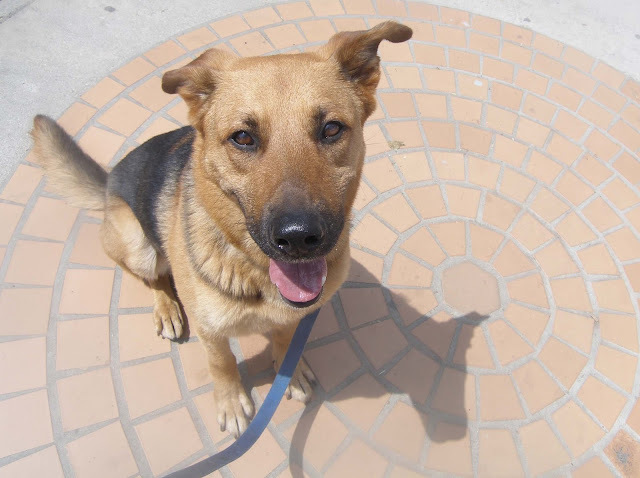 He was Dog of the Week in Oct. 2009. He watched passersby while I look into the office of the Daily Planet. he spent some time learning to be an urban dog. 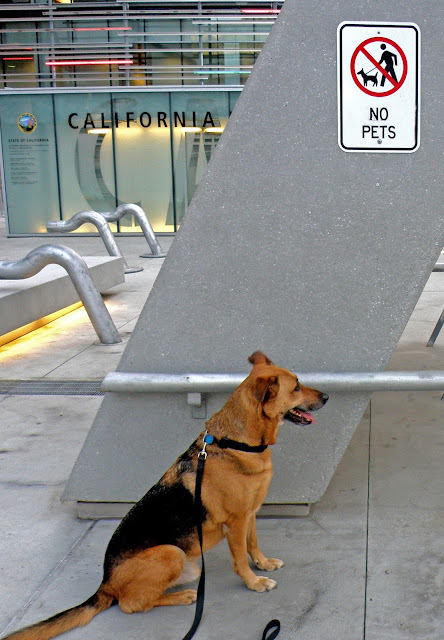 He didn't see the no pets sign until he got there. We visited the old police station, Parker Center, as well as the new one. In sprig we began another epic walk, all the length of the combination of all the streets called Broadway in Los Angeles. 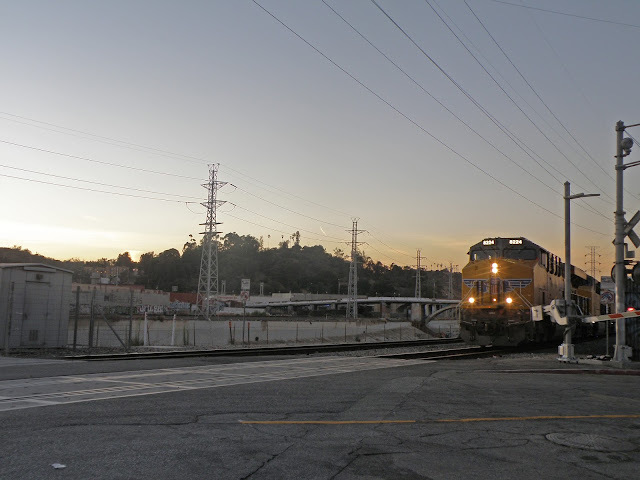 We started at the northeast end, in Lincoln Heights. We found several of these stairways to nowhere, but didn't take them. 2010 was a great year for Buddy. 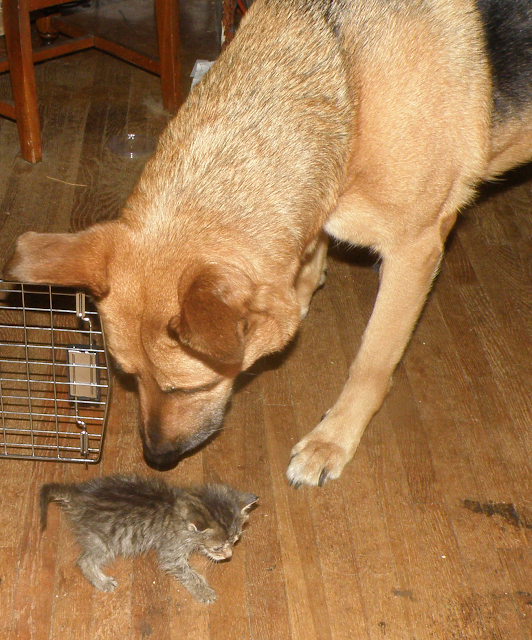 We got his little kitten friend Lila! 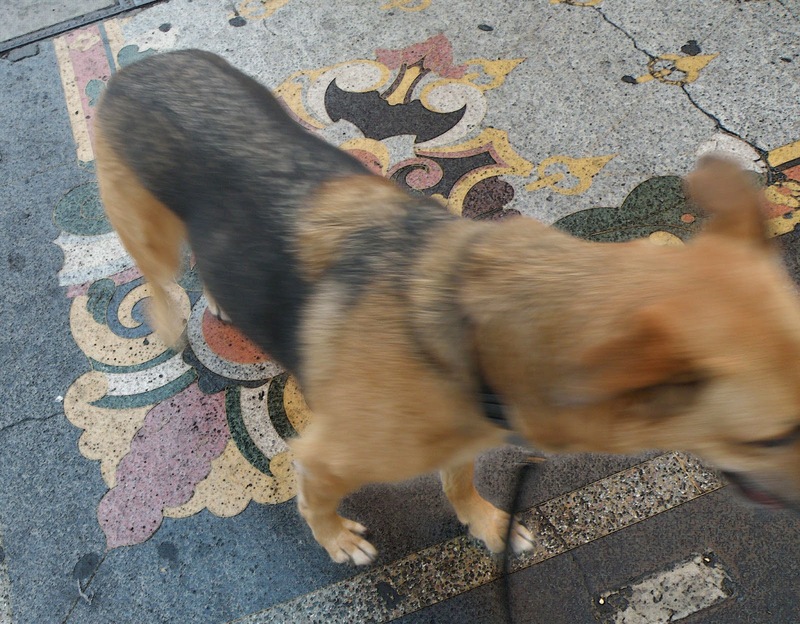 He walked over the terrazzo in front of old theaters on Broadway. took a detour on Hill St.
What better way to spend my birthday than hanging out with my dog. Continuing down Broadway-- March 2011, he met this guy outside the tattoo parlor. and kept on walking.until we reached the place where broadway ends at Main St. He met a lot of dogs. Some of them looked like him. Many walks by the river at North Atwater Creek. Once, he had been afraid of trains, but he waited by my side while this one went by. 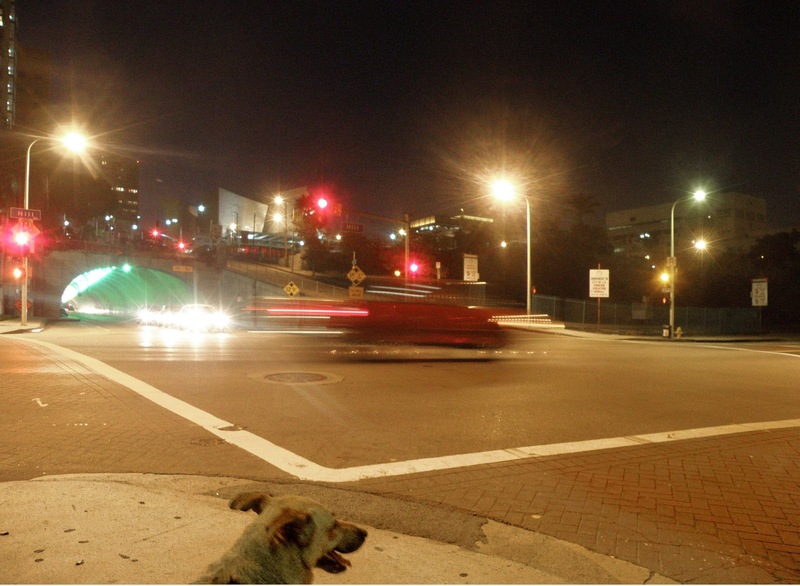 He waited patiently while i photographed the North Main St. Bridge. If he was afraid, I didn't snow it. 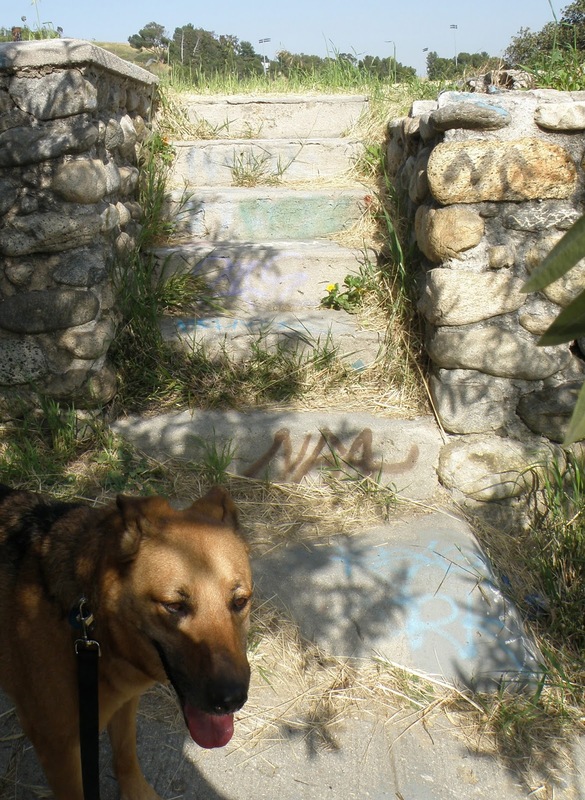 It was an unexpectedly happy day when I took him to see a doomed house in Echo Park and we met a man with two little poodles and a 12 year old Golden Retriever. He usually liked the little dogs best, but he was happy to find a pal his own age. He only lived another month. He was the best walking companion I ever had. Which Way, City of Vernon? 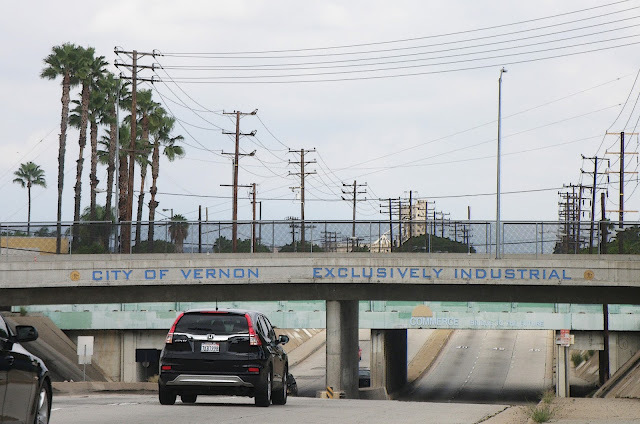 Vernon is a strange city near the L.A. River, long known for corruption. I first wandered into Vernon in 2007, when I was following the course of the L.A. River. It's best known landmark is a mural on a slaughterhouse, and it's usually described as having unpleasant odors. The area had been known as a place to raise hogs in its earliest days. However, I don't believe the hog farms were as pleasant as these pictures. The hogs were fed on garbage from the nearby dump. It has long been known for accommodating slaughterhouses and other smelly enterprises, but its politics have stunk even more than its factories. I knew it was time to revisit Vernon when I read about this new development. When the 45 units are occupied, the population of Vernon is expected to double. Population estimates have stayed at around 90 -100 for years. Can you call it a city if only 90 people live there? You can if you declare yourself as Exclusively Industrial from the beginning. Vernon was incorporated as a city of the 6th class in 1905, under the leadership of John Baptiste Leonis and the Furlong brothers, James and Thomas. Sixty eight people turned up to vote at the election. Sixty four were in favor of incorporation, and four were opposed. Three days later, the election was challenged by Burbank and Baker, who sold real estate in Huntington Park and Hermosa Beach.. They claimed that the population of Vernon was only 375, not the 500 required of a city of the 6th class. Nevertheless, the Federal Census listed a population of 700+ in 1910. That was how the City of Vernon began. Southern California was full of farmers and sick people seeking sunshine and a year round growing season. 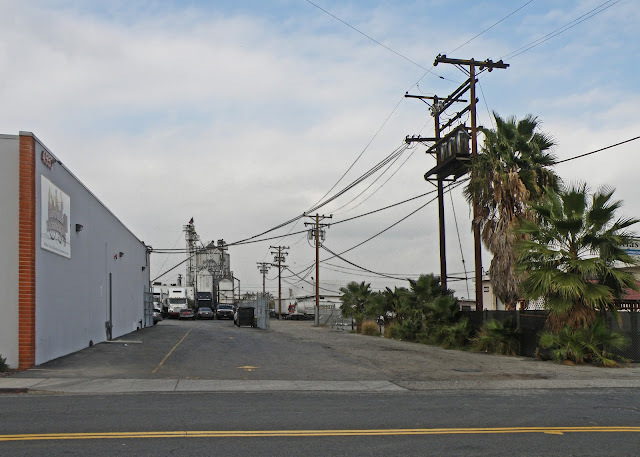 No one would have guessed L.A. would become an industrial city, except for the founders of Vernon. John B. Leonis offered free land to anyone who wanted to build a factory, and by 1905 there were two factories and two lumberyards there. 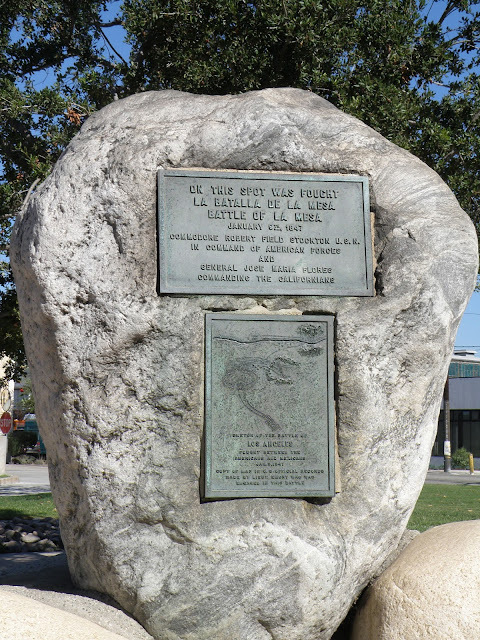 The Los Angeles and Salt Lake Railroad was completed that year, the third railroad passing through Vernon. Then came battles between the hog farmers and the industrialists regarding the city dump. The hog farmers wanted the dump, but the industrialists did not. I haven't been able to discover just when the dump was closed, but poor folks were squatting there at the time of the Pneumonic Plague outbreak of 1924. 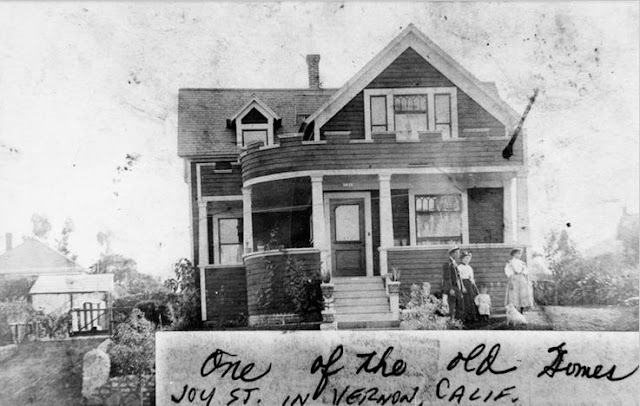 The L.A. Times was sternly disapproving In 1912, they said, Vernon was "believed to be the only incorporated city of nearly 1,000 that boasts no church." The founding Furlong brothers built a church the next year. The first event was the wedding of their sister Judith to English Chemist George Poxon. Many people continue to collect the pottery made in the factory the Poxons produced in Vernon. The Times gave Vernon and its founders more respect as it became a productive factory town in 1915. That was the year Santa Fe Ave. was paved, and this bridge over the L.A.River at 26th St. One area was reserved for the smellier enterprises of stock yards, slaughterhouses and oil refineries. Other areas were occupied by iron works, wheel works, planing mills and a concrete plant. 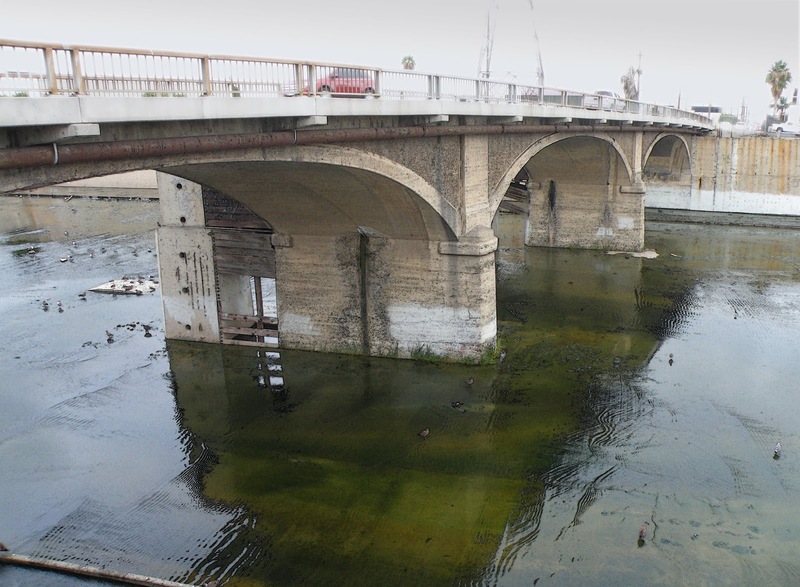 26th St. bridge. 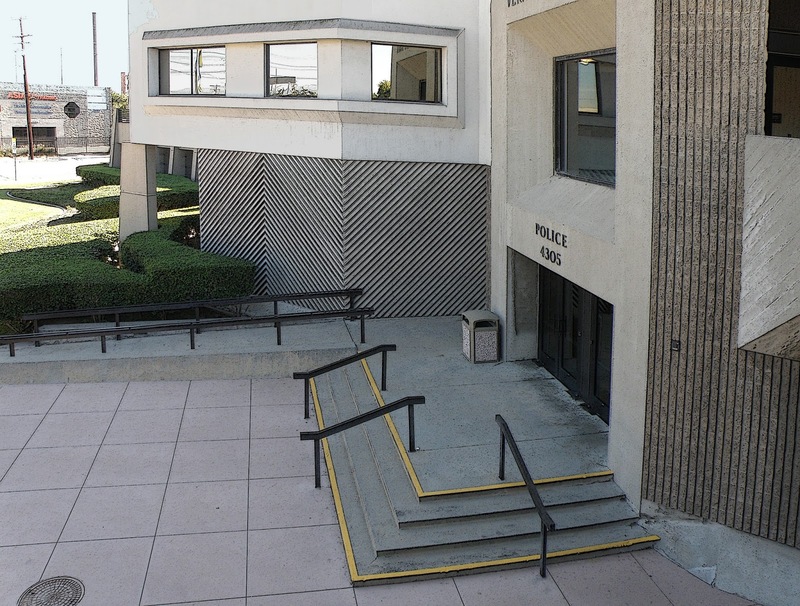 The original railing was more attractive. The 1930 census reported the population at 1,269. Vernon had annexed the Central Manufacturing District in 1926, so the area was larger by then. This was the largest recorded population in Vernon's history. Homes like this, built in 1894, were rapidly disappearing to make way for industry. 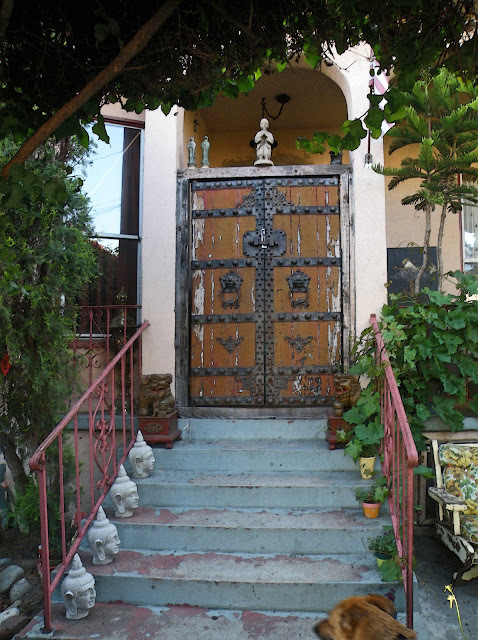 Older homes were condemned, and no building permits for residences were issued. The city fathers gained power by causing the voting population to shrink, until there was no one left except city employees and their families. 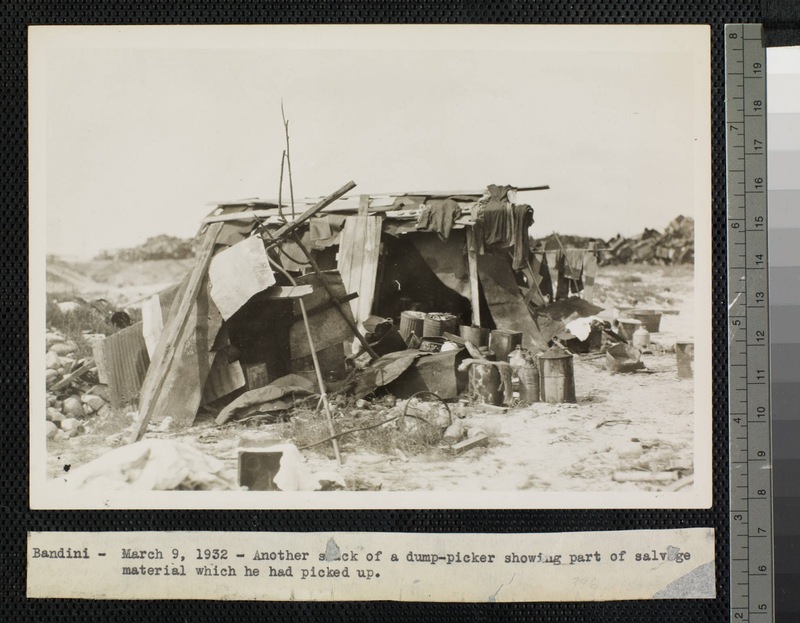 Sometime during that period, the unemployed who lived by the dump were evicted. By 1940, the population was down to 842, even while surrounding southeastern county was growing. In 1941, James Furlong, founder and mayor of Vernon, died at his home at 2046 E. 52nd. He was the last of Vernon's mayors willing to live within Vernon's city limits. Furlong was succeeded by John B. Leonis. In 1943, the "real" and "voting" homes of the city fathers were disclosed. Mayor John B. Leonis really lived at 647 S. Hudson. He registered to vote at 2533 38th St. in an apartment above the bank he owned. He and 5 other Vernon officials were indicted on charges of illegal voting in 1943. The case was dismissed for lack of evidence. The residences of city officials and voters would not be questioned again until 1978. Residence of John B. Leonis. Later occupied by his grandson, Leonis C. Malburg. Smog had become a topic of conversation in the 1940s, and Vernon's factories were a big contributor. 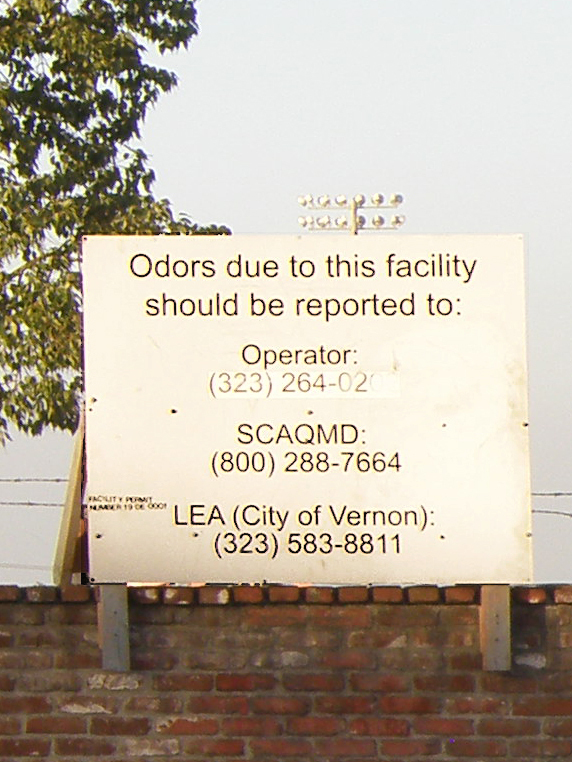 Vernon has continued to be a major polluter. 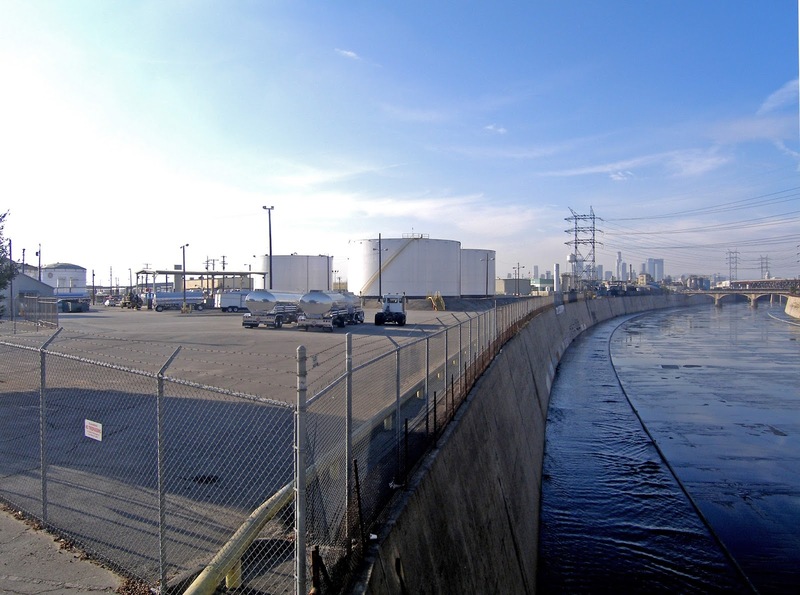 Exide battery recycling is the most recent saga, and the clean-up is still a matter of dispute. This is a big topic which I hope to address in a future post. 229. In 1961, there were 36 dwellings in Vernon. Half were owned by the city and rented to employees. The other half had all been built before 1920. No building permits had been issued since then. 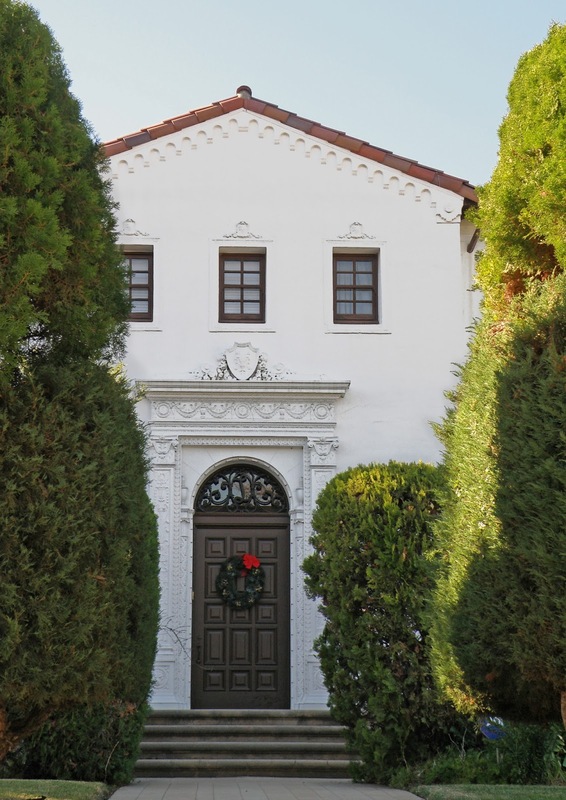 The ten room house Miss Lastenia Ybarra offered for sale for $120,000 in 1961 was one of the last of the old houses to go. It had been built by her grandfather in 1906. 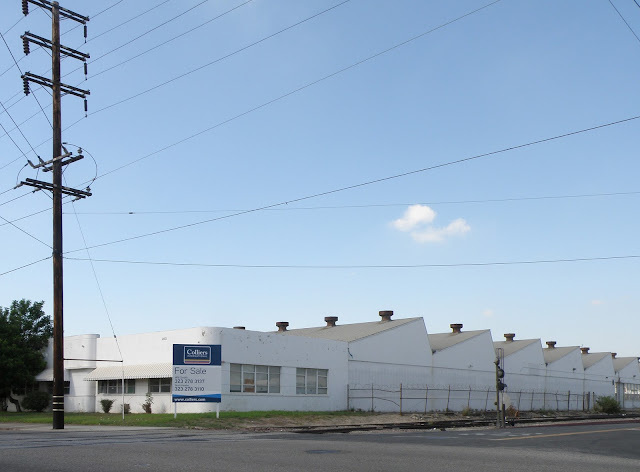 The address, 2326 E. Vernon Ave, is now occupied by a Flowserve Corporation factory. The city got in trouble for other reasons, like not paying sewerage fees and refusing to put up traffic signals, but continued to prosper. 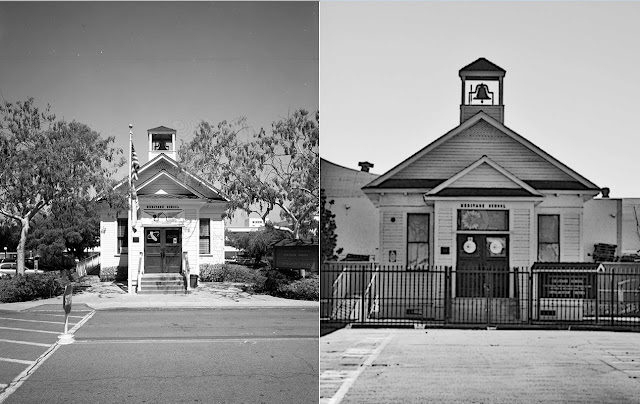 In 1953 they went from a city of the 6th class to a charter city. In 1954 they made a Proposition 13, a constitutional amendment to change voter qualifications. They wanted to make property ownership a qualification for voting, and allow non-residents to hold office. Vernon's leaders and the state chamber of commerce loved this. The legislature declared it to be unconstitutional. In 1974, Leonis C. Malburg was elected mayor of Vernon, after the death of Robert Furlong, who was the son of Vernon co-founder Thomas Furlong. Malburg was the grandson of John B. Leonis and had served 18 years on city council. In 1975, warehouses were replacing factories, but the city seemed OK. Architects Marion J. Verner and Associates won an award from the Society of American Registered Architects for the City Hall and Police Headquarters they built. Swift and Company had closed its slaughterhouse, after a longer time operating than anyone could remember. Yet there were still enough slaughterhouses left so the police were still called upon to round up steers run away from other meatpacking plants, as reported in the L.A. Times. Leonis Malburg hired Bruce Malkenhorst Sr. in 1975. In 1978, Malkenhorst thought he'd save the city some money by laying off 17 firemen, even though there had been a 10 year hiring freeze and the force was down to 100 from 140. Not only that, he selected the 17 to be laid off by a lottery, rather than by seniority. the firefighters organized a job action. Negotiations went on for a year and a half. Carlton Claunch, a retired firefighter attempted to establish residence and run as a pro-union candidate. During that time, Mayor Malburg was indicted for fraudulent voting and perjury. He was living at the house owned by his grandfather at 647 S. Hudson, while using a Vernon address. Bruce Malkenhorst and city attorney David B. Brearley were indicted for conspiracy to commit extortion and bribery. They had put "unlawful pressure" on firefighters to persuade Carlton Claunch to leave town and drop a lawsuit he had filed against Malburg. The charges were ultimately dropped for lack of evidence, once again. Most of the firefighters eventually went back to work, but the force had been reduced by attrition. Leonis Malburg gave this office building as his address while living in Hancock Park. Next, Malkenhorst turned his attention to the police department. He eliminated many positions, and turned others into civilian jobs. In 1980, former Police Chief Spencer E. Hogan, recently retired after 32 years of service, ran for city council. He had been living in city owned housing, and was immediately evicted after declaring his candidacy. Another resident, Philip Reavis, then president of the Vernon Chamber of Commerce, also decided to run for office. Reavis, the owner of one of the few private homes in Vernon, allowed Hogan to move in, and together they ran to challenge a pair of incumbents. spencer Hogan got the most votes, but Malkenhorst disqualified six ballots, on the grounds they were those of non-residents. This made incumbents Hilario Gonzales, and Keith K. Kaeser, the winners. It was the last contested election until 2006. The incumbents continued to run unopposed. Phillip Reavis said he spent all his money fighting, but the city of Vernon was too rich to fight. 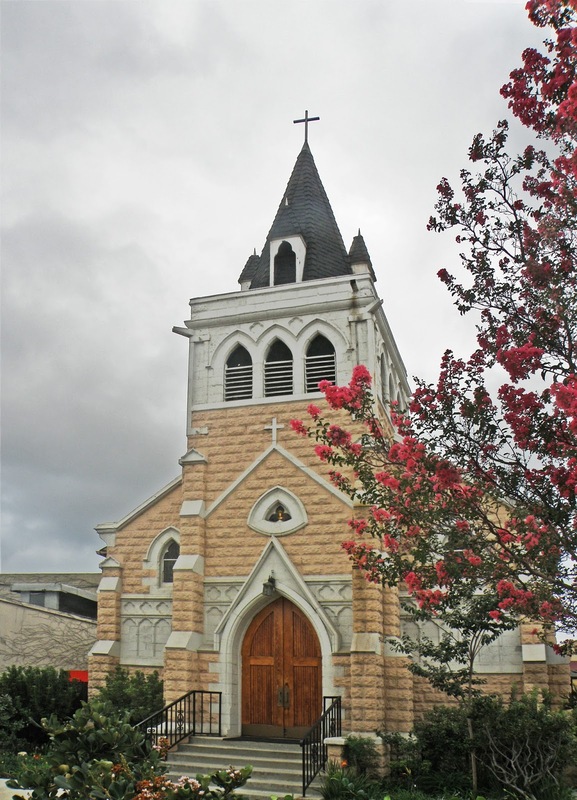 St. Martha's parish was moved from the old church on Santa Fe Avenue to Huntington Park. Fortunately, the old building was saved. For a while it served as an office for Catholic Social Services. In 1986, it became the Holy Angels Church of the Deaf. Bruce Malkenhorst became known as the highest paid city official in California. 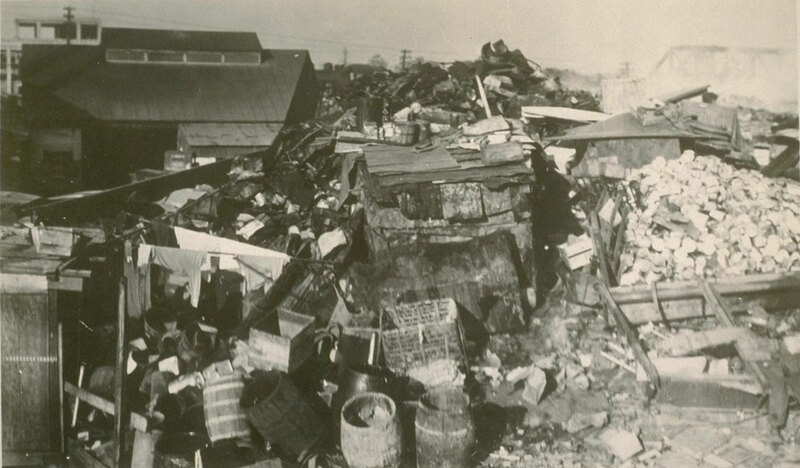 A dispute over construction of a hazardous waste disposal site went on for several years, until it was defeated in 1991. The rendering plant and fertilizer factory continued in operation is spite of their noxious odors. Vernon city electorate exercised its right to change Vernon from a general law city to a charter law city in 1988. The L.A. Times wrote up Bruce Malkenhorst in 1989. They described him as the highest-paid city official in California. His annual salary was $162,804. It would continue to rise. Furlong Place-- housing for Vernon employees, alongside City Hall. In 2004, Eduardo Olivo, who had been Vernon's city attorney for the previous five years presented the Vernon City Council with documentation of bogus expense-account reimbursements claimed by city manager Bruce Malkenhorst Sr. Rather than investigating Malkenhorst, the city council fired Olivo and sued him for breach of contract. They made haste to declare his report as "privileged document" in order to prevent any outsider from reading it. They replaced Olivo with Eric T. Fresch, a man of dubious reputation. Fresch subsequently became the city manager, after Malkenhorst Sr. resigned in 2005. In 2010, the L.A. Times published this article about Eric T. Fresch and some of his family members. A later state audit blamed Fresch for city's difficulties. The resignation of Bruce Malkenhorst Sr. in 2005 came during the county district attorney's investigation, which had been inspired by Malkenhorst's enormous $600,000 salary and his expense account. Fresch replaced Malkenhorst Sr. as city manager in 2006. His son, Bruce Malkenhorst Jr. became City Clerk. In January 2006, 8 people attempted to move to Vernon, and 3 of them tried to run for city council in the upcoming election in April, which would be the first election in 25 years. Don Huff, David Johnson and Alejandro Lopez ran for city council. 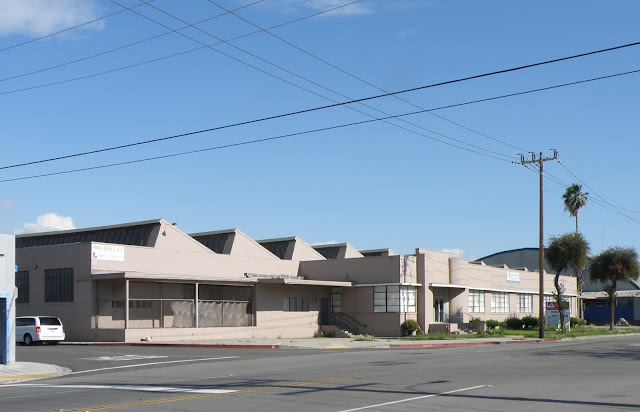 Vernon's leaders had the power company disconnect the building at 2721 E. 46th St. Then they hired armed private investigators to follow them, and finally had the police break in and remove them by force. They moved into their cars near the property. A court ruling said that did not disqualify them as voters. The challengers moved into a decrepit commercial building around here somewhere. Vernon officials tried to cancel the election but were ordered to proceed. The election was held, but Vernon officials refused to count the ballots, and kept them secret. In June, Vernon was ordered to hand over both the ballots and the report by Eduardo Olivo, which included 1,700 pages of city records in four bound volumes. 68 ballots were counted--the same number of ballots in the 1905 election to incorporate. The results were announced in October and the incumbents had won, to no one's surprise. Huff was pleased that he'd received 10 votes when he had only expected 8. He said the city would never again go a quarter-century without an election. His prediction came true. Olivo's report and the accompanying documents were the beginning of investigations which continued for years. In 2009, Leonis Malburg resigned as mayor, and Hilario Gonzales took his place. Later that year, Malburg and his wife Dominica Malburg were convicted of voter fraud and conspiracy. In December 2009, Leonis Malburg and his wife were convicted of conspiracy, perjury, and voter fraud. (see editorial, Los Angeles Times, December 9, 2009, "Justice Comes to Vernon") In 2010 Leonis and Dominica were sentenced. Elderly white people do not usually go to prisons, and neither did they. Leonis Malburg was fined over $500,000, given 5 years probation and prohibited from holding public office. Dominica Malburg was fined $40,000. 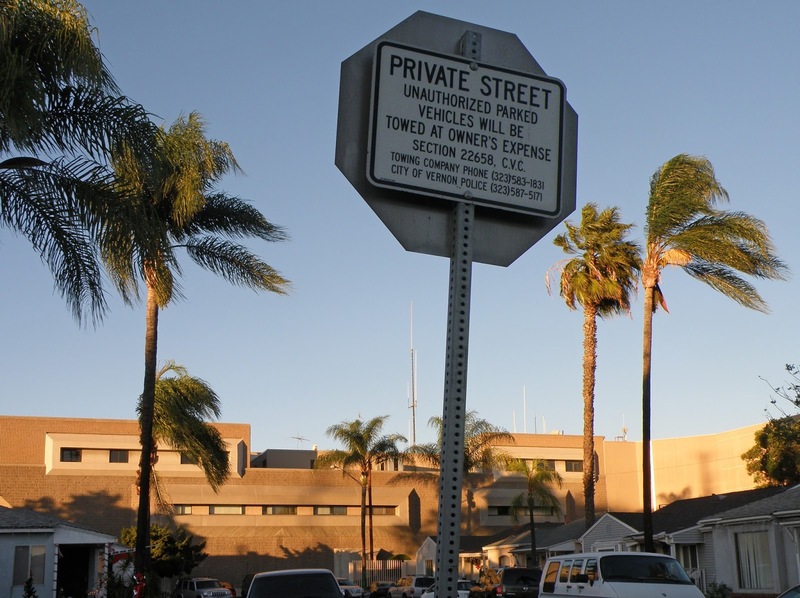 Investigations by both the county and the state continued through 2010.The L.A. Times described Vernon as a "tightly controlled fortress." Donal O'Callaghan replaced Frecsh as city manager. Fresch continued to work for Vernon as a legal consultant under a different title. O'Callaghan was not an improvement. He was replaced by Mark Whitworth in July and indicted on Oct. 18 for criminal conflict of interest. He plead guilty in 2011. In 2011, speaker of the California State Assembly John A. Perez sponsored legislation to disincorporate the City of Vernon. (L.A. Times Mar. 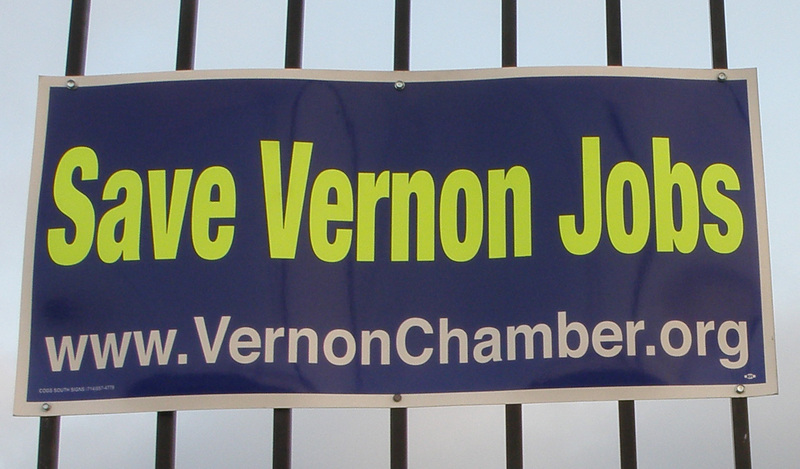 2, 2011) Even the New York Times noticed--.John A. Pérez is behind the plan to make Vernon a part of Los Angeles. Perez was backed by the L.A. City Council, as well as Mayor Antonio Villaraigosa, Los Angeles County Sheriff Lee Baca and County Supervisor Gloria Molina. L.A. Weekly called it a fight to the death between the City of Vernon and Assemblyman Perez. Both the Vernon Chamber of Commerce and labor unions opposed this on the grounds that jobs would be lost. These signs appeared all over Vernon. Vernon was working to save itself in 2011. The city hired John van de Kamp in February to do an independent audit. 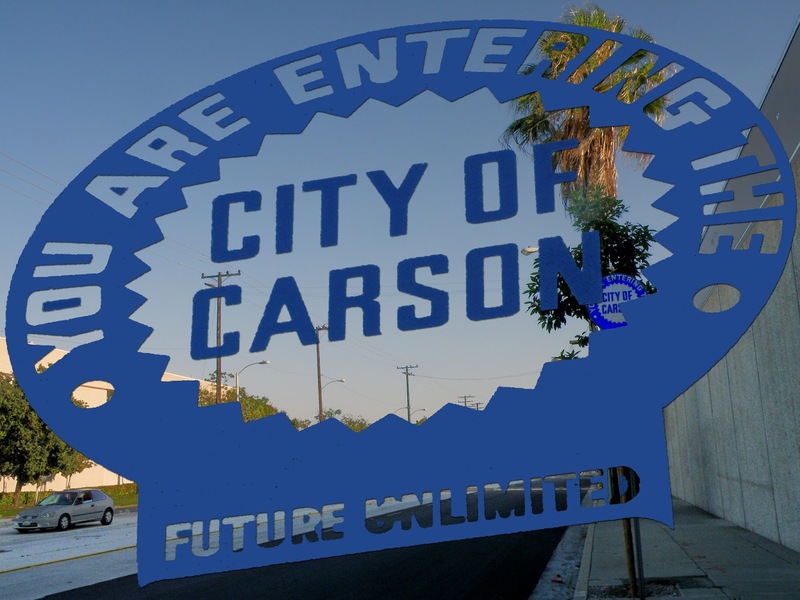 In May the city of Vernon approved a package of governmental reforms in an effort to thwart a bill in the California Legislature calling for its disincorporation. The package included salary caps for city officials, term limits and pay cuts for council members. Further reforms were passed in November. An audit of Vernon's finances showed the city to be seriously in debt, reported by L.A. Times Aug. 13, 2011 There had been ideas that either the City of Los Angeles or the City of Commerce annex Vernon, but neither of those cities wanted to assume Vernon's debts. The State Assembly ruled against disincorporation Aug. 29. In 2012, the newly reformed City of Vernon had two elections. In April, Michael Ybarra ran against Daniel Newmire for City Council. Although Michael Ybarra's father Thomas had served as councilman for four decades, Michael Ybarra was considered to be the "reform" candidate. Newmire had served as an interim appointee, and was considered "old guard." Investigations into who really lived in Vernon preceded the election. Both candidates challenged several ballots. Ybarra won by five votes. His daughter Melissa was elected in 2015, to replace her father after his death. In June, Luz Martinez ran against Reno Bellamy, a friend of Newmire, for another vacant seat. Bellamy's victory was followed by the Sept. 26, 2012, election fraud probe. In Oct. 2012, election results overturned. Luz Martinez declared the winner. Eastern Publication Group said this about her. Yvette Woodruff-Perez was elected in April 2015, establishing the first female majority in Vernon City Council History. Leticia Lopez was elected to City Council as a write-in candidate in April 2016. "Women are shaping the future of Vernon." was the headline in Eastern Group Publications, the newspaper franchise for the cities and neighborhoods of Southeastern L.A. County. They reported the victory of Leticia Lopez a month later. The construction of Vernon Village on 52nd Drive has been the most visible change to the City of Vernon in recent years. 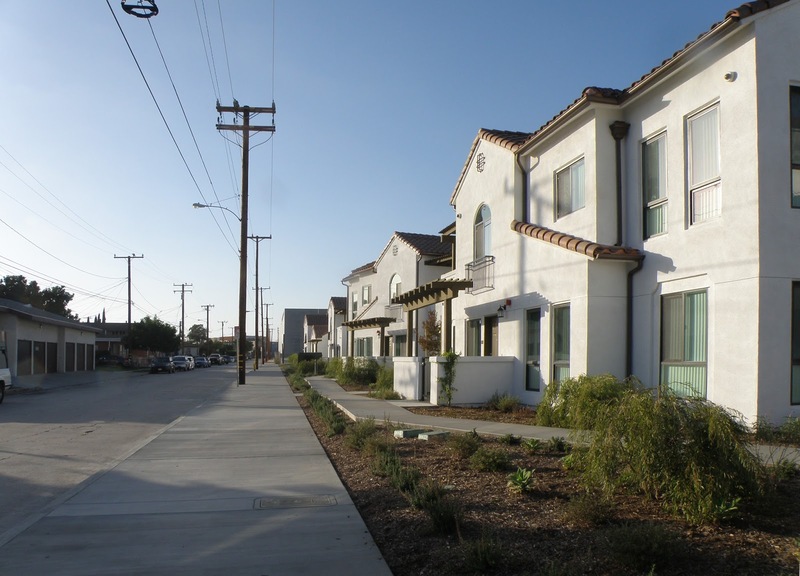 The other side of the street is the City of Maywood, so the residents of Vernon Village are not completely surrounded by industry. These folks were heading to a quinceanera in a big tent next door. In January 2016, John Van de Kamp, the independent reform manager filed his final report. I agree. Vernon has good things to work with. There is handsome industrial architecture which could be repurposed. It is the site of an historic battle in the Mexican-American War. I'd love to see re-enactors to take over Vernon on a Sunday. This is commemorated on some rocks in front of city hall. 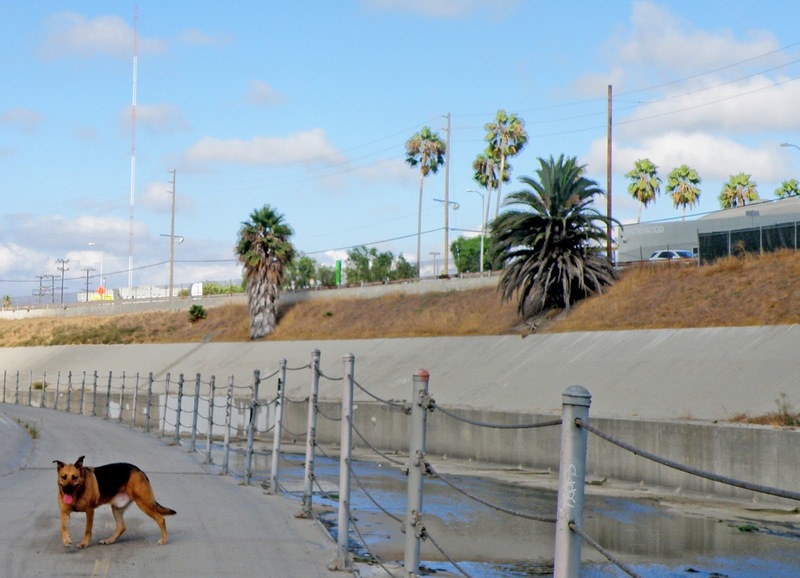 The Los Angeles River Bike Path could extend further downstream in Vernon. The bike path was built in the bad old days when the Vernon government didn't want it. Now, when there is renewed interest in the river, would be a good time to extend the bike path downstream through Vernon. If we are lucky, it will go all the way through downtown L.A. too. The river could be opened up for recreation, so people don't have to break through fencing to get there. 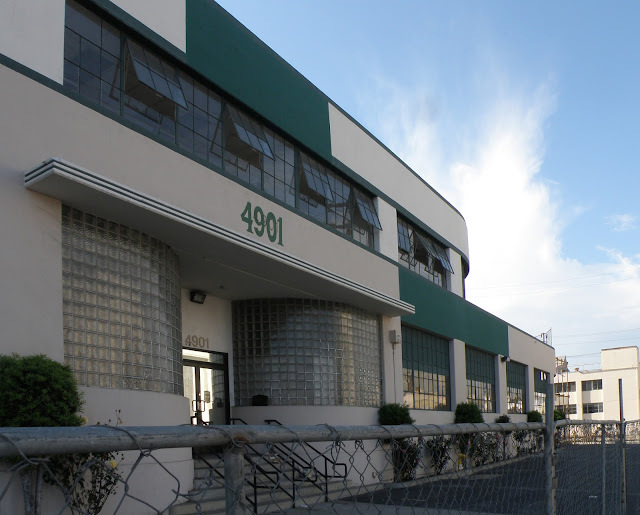 The L.A. downtown arts district is expanding beyond downtown. The Santa Fe Art Colony is already pushing the edge of the Vernon city limits. What remains to be done is clean up after the battery recycling factory, Exide! Can they clean up the pollution as well as they seem to have cleaned up their politics?